Image caption The fire station has been thanking members of the public for their donations. A fire station which gave away its knitted mascot to a distressed child has had hundreds of firefighting teddy bears donated. Firefighter Richard Scarth posted on Facebook asking for a replacement after his team gave their bear to a boy hurt in a bus crash in July. Whitchurch Fire Station in Hampshire has now been inundated with more than 100 cuddly toys. Mr Scarth said he and his colleagues were "overwhelmed" by the response. He said firefighters keep a toy with the engine to "calm or comfort children at incidents". "We attended a crash where the child went to hospital with their mum and took the toy with them," he said. "I just put the post on Facebook as a throwaway comment and we were completely overwhelmed by the kindness and support from the public." The crew manager's post has been shared more than 4,000 times with more than 900 comments or offers of help. 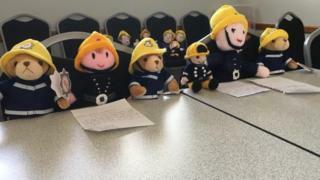 Mr Scarth said any more bears would now be passed on to other fire stations.